Ah, here she is. The one dry shampoo that kind of changed my life. Or, rather, my hair's life. (Since said discovery, my fine, limp, rather sad strands of yesteryear have pretty much left the building and taken on a new identity altogether—but more on that in a second.) You see, prior to discovering this gilded-and-blue can of hair magic in my fellow editor's bathroom, I had found myself in a serious dry-shampoo dilemma. For years, I had endured a litany of intense yet short-lived relationships with a variety of oil-sopping formulas that while initially intriguing ultimately left my strands unattractively limp. It felt like a personal curse: As soon as I fell in love with a new suitor, one day it would suddenly up and skip town, leaving my hair greasier than it started. And mind you, this typically happened just when my strands and I needed needed a boost (e.g., before a date or a big meeting). Shady behavior, to say the least. Since my hair is naturally fine and straight, I typically blow it out with all the volume I can possibly muster on the rare occasion I decide to forgo my newly adopted air-dry routine. However, there's only so much the best volumizing shampoos, mists, foams, and brushes can do, and after the fact, my hair is usually painfully clean, slippery, and all around not the best. On this particular occasion, my co-worker/work wife/BFF Kaitlyn McLintock and I had made plans to go out, and I was frustrated. Out of desperation, I braided my hair mid–Uber ride to her place in hopes to add a tad of texture and bend into my too-clean and thus uncooperative strands. Spoiler: The improvement was minimal. Kaitlyn's apartment is pretty much a treasure trove of waiting-to-be-discovered diamond-in-the-rough beauty products, so as soon as I arrived, I began sifting. "Do you have any dry shampoo?" I asked. "Or, like, anything that will make me look like I have more hair? But that won't make it sticky?" Swifty, she pushed OGX's Bodyfying Dry Shampoo into my hands. "It's good," she said. Even though I know tons of people adore OGX, I'd admittedly been slacking as a beauty editor and hadn't tried much from the brand. So I had no preconceived notions or expectations; I was heading in neutral AF. That said, I found myself immediately smitten. First of all, I just like the packaging, The nozzle—unlike 87% of the dry shampoos I open—didn't clog or fail to spray altogether, and it had a nice, satisfying spritz volume. It also smelled amazing, and I'm one of those people who is annoyingly sensitive to how a dry shampoo smells. (Not much plays well with dirty hair, guys—let's be real!) More importantly, however, were the results. The formula didn't discolor my light blonde hair, and while it immediately spruced up my strands with flexible body and volume, it didn't leave behind any kind of tackiness, stickiness, or all around ickiness. In fact, I even went as far as to spritz it through my ends because the volumizing results are just that exciting. Approximately 10 seconds after my initial spray, the previous slip-'n'-slide texture was replaced with the perfect amount of mussed movement, body, and bounce. I was stunned. I had found liquid gold, and it costs less than what I normally spend on coffee every day. (Yes, I'm aware I have a problem.) There's a hair god, after all! I wanted to shriek. I know what you're thinking: That kind of happiness just can't last. Yet roughly two months later, our honeymoon phase is still going strong. I still love my OGX dry shampoo; in fact, I bring it with me everywhere I go. When I forget to apply it, it's kind of like reliving that dream when you walk into your fourth-grade classroom with just your training bra on (or whatever your personal version of that dream is)—exposed and traumatized. Plus, since this under-the-radar dry shampoo is infused with plant fibers and collagen, it's actually doing my strands some good. 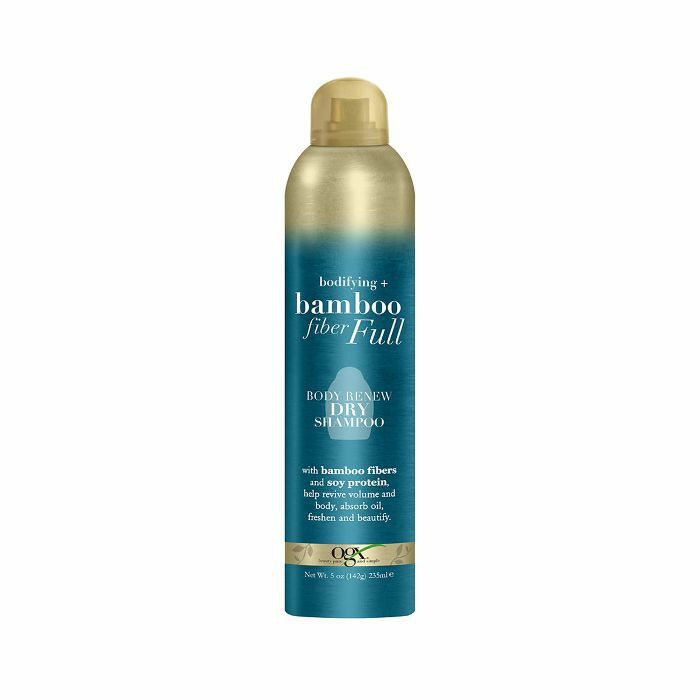 Overall, I'm addicted to this dry shampoo's soft and flexible finish, its impressive volumizing capabilities, and the perfect amount of grip it leaves behind for styling. Quite simply, it's the best I ever had. And yes, I even wear it with my sweatpants, hair tied, chillin' with no makeup on.